About two months ago, Bennett Foddy, creator of the wonderful QWOP, GIRP and Super Pole Riders, wrote an article titled Why you don’t want an online mode in TowerFall, which covers the issues with including online play. Foddy very clearly explains the technical problems involved with them, and touches on the fact that games could also be designed with only offline play in mind. It’s a great article, but I can’t help but feel it’s still slightly apologetic, seeing how much time is devoted to explaining technical hurdles. In my opinion, there’s no need for excuses when a game has no online mode, and instead derives its strength from so-called local multiplayer. The lack of local multiplayer in commercial games has become a big frustration for me and others. Since around 2006, me and a group of friends, one of them a developer, have held regular weekly game nights at one of our houses. We started out playing Nintendo titles like Wii Sports and Mario Kart, interspersed with feverish matches of Bomberman. The latter two are still played on many occasions, even after we switched to the HD era and all bought PlayStation 3s. After Call of Duty: Modern Warfare was released, we played each new installment. Not because of the appeal of the military theme (it’s actually a turnoff for me), or because of the great campaign (play one and you’ve played them all), but because of the fantastically visceral multiplayer experience. CoD was one of the few games that offered 4 player split-screen. We had been playing split-screen for years on GameCube, so the upgrade to HD finally made it to where we could see what we were doing on screen. And we loved it. That is, up until the latest installment, Ghosts. In Ghosts, only 2 player split-screen is available, which means there are always people sitting on the couch without a controller in their hands, waiting for their turn against only one other human player and a handful of useless bots. It’s boring. With not much to play left, my friends sold their PS3s one by one, as they prepared for next gen. We went back to those old, forever replayable Nintendo games. 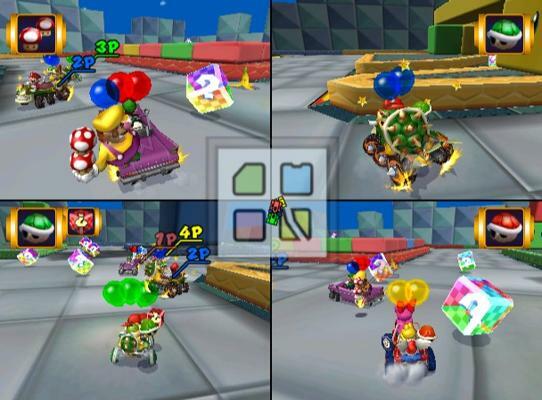 Like Foddy argues, Nintendo focuses on a great local multiplayer experience. If you don’t rush to point to Nintendo’s failure to catch up with online, you will see the amazing experiences they created because of it. Nintendo has always been about getting together. ‘Famicom’, or 'family computer’ says it all, and came with two controllers. Every console up to the Wii-U has focused on the living room experience, on gaming as something you do with family or friends. I used to play games with my brother and dad, and we poured many hours into Duck Hunt, Donkey Kong Country and Goldeneye. I came to love games because of the experiences you can share. Then I found out there’s hope. A few years ago, a small group of indie developers from Utrecht, the Netherlands, started organizing get-togethers called ‘local multiplayer picnics’. Jan Willem Nijman of Vlambeer and producer Kitty Calis, also responsible for a series of ‘indie meetups’, and fellow game developers introduced us (developers and other game people) to games we can now comfortably place among the new wave of local multiplayer games. At that time, I didn’t know any of these, because they were still in development. They were early builds, shared by their respective makers for playtesting. It was a huge success. Over a series of ‘picnics’, we were introduced to games like Nidhogg, Super Pole Riders and TowerFall, each one a competitive multiplayer game, each one a unique digital sport. Players switched around and waited anxiously for their turn, booing and cheering, while exchanging high fives and shoulder punches. There was even a party in Rotterdam at one point (VERSUS), combining chiptune music by the Eindbaas collective and drinks with fanatical bouts of Johann Sebastian Joust, and Samurai Gunn played in a movie theatre. To me, all this felt like a revelation: video gaming as a real social event. I have only recently started in game development myself, making small games at game jams. But I’ve been professionally involved in the industry for years, and know many developers through my work. I organized large scale game jams and networking events for developers in the Netherlands, as part of my job with Dutch Game Garden, a government funded game studio incubator. A few months ago I relocated to Berlin, Germany. At the A Maze festival, which took place here in April, it was again made clear that indie developers from around the world are interested in developing for local play. Many of them are creating new and exciting ways to play together on the same screen, an experience that they find lacking in big budget titles. It’s a positive development, but I don’t see it mirrored in bigger titles. Is it only us who are so close to the fire, that see the potential? Is gaming as a social activity generally still frowned upon? My love for couch gaming obviously stems from my personal experiences. I can’t rely on everybody, or even most people, to feel this way. A lot of especially younger gamers have grown up in the era of always online computers, and are used to playing online multiplayer. Especially PC gaming is inherently a more solitary experience. The desk and inputs simply don’t invite others on the machine, and each player simply has his or her own machine and connects over the internet or LAN. But what I do know is that console gaming to me and many others still is a social experience. Console games are made to be experienced in the living room. They are made for couch gaming. To a certain extent this is even true for single player games. When my girlfriend is in the room, she plays along or talks with me about what I’m playing, or the other way around. Then why do so many big budget titles only allow online multiplayer? Let’s discuss one of the more often heard complaints, which is that not everybody has friends around willing to play games with them. I get this problem, but it’s not a problem with the game. Sure, being able to play online has resolved this issue in many cases, and most games are developed with online play in mind. That's wonderful that we have the possibility to connect to so many others at any time. But to be fair, not being able to play a game because of a lack of available players is the result of one’s personal social situation, not of the game itself. These critics don’t say ‘I’d prefer playing this with people online’ or ‘I can’t see the appeal of playing offline’. Instead they are articulating a real-life hurdle they experience in trying to play the game, and transferring this problem to the game designer. The designer should have come up with a way that this game, which was meant to be played offline, together, should be made playable by individuals over the internet. It's like asking a board of card game designer to include a single player scenario. I take issue with this. As gamers we still face the social stigma of being anti-social, of being loners. Many non-gamers still regard video games as trivial entertainment for socially awkward people, who can’t handle interacting with the real world. Or worse, as harmful and dangerous. As games rose in popularity they also became more accepted, if only through their omnipresence. But at the same time, games have become increasingly less focused on local multiplayer, to the point that almost all PS3, Xbox and PC games are either played in single player or online multiplayer. This means that gamers are more often than not engaged in a solo experience that does not involve the people around them. Of course this goes parallel to the integration of online services in every part of our lives, drawing us more and more to our personal screens. Have no fear, I won’t be telling you smartphones are bad. I love mine. But can’t we use these personal devices locally some more, now that we all have them? Why can’t we play more game like Henry Smith’s wonderful Spaceteam, screaming at each other and feverishly shaking our devices at every asteroid heading towards us? Or play a game of sensual finger twister with Game Oven’s Fingle? I have heard no complaints about these games not being online, because the experience they offer is so unique that you can’t even imagine how that could work. Why would we want to force an online mode into that? Similarly, should we feel the need to tick the ‘online’ box on every console or PC game that comes out? No-one complains about the lack of offline modes. As you can imagine, I personally would like to see more games playable in split-screen, but I would never assume it as a feature. If it’s not there, there's simply less chance I’ll play the game, and I’ll look elsewhere for my multiplayer gaming experience. There was a time when you were able to play most of the important games coming out. Presently, there are way more games coming out each year than any of us can play. That means we have to start making choices, and not just based on quality. There is an overwhelming amount of high quality games. Personal choices and preferences start to matter, which is a sign of the medium maturing, slowly but steadily. That also means you can choose a game based on your preference for offline or online play. Not having one or the other is not a sign of inferiority, it’s a design decision. Many people still don’t have this notion. The recently released Titanfall (not to be confused with TowerFall, which is in many ways the oppposite) was praised highly for its amazingly refined multiplayer. Reviewers wrote they were putting tens of hours into the game, and were far from bored. At the same time however, many of them complained about the lack of a single player. Some even went so far as to state that it would have extended the life of the game. I have a hard time understanding this point of view. If a game compels you to play hours at a time, why shouldn’t that be considered a complete game? I would gladly point these reviewers towards any fighting game to date. Differentiation in games is a good thing. We should applaud focus on quality of gameplay over quantity of features. We should also appreciate every move to make gaming more social in the immediate sense, and every new way to play them. Games have matured to be part of society, and can be designed to be played at parties, or to be used in for instance education or health care. They’re not just on your personal computer anymore. Yes, you’re always connected, but does that mean everything should be online? We can play different games at different occasions. For some, you have to get together to have the experience, similar to playing a board game, or sports. Samurai Gunn, Nidhogg, TowerFall and Sportsfriends have all launched to an enthusiastic audience, and I’m glad they’re well received. Meanwhile my friends, some of them very picky about what they play, have become fanatical TowerFall players, and I’m glad about that. Unfortunately, there are only a few games like these. We need more. Way more. If there’s anything reviewers should be lamenting, it’s the lack of local multiplayer games.